The second Bennington (CV-20) was launched 28 February 1944 by New York Navy Yard, sponsored by Mrs. Melvin J. Maas, wife of Congressman Maas of Minnesota; and commissioned 6 August 1944, Captain J. B. Sykes in command. On 15 December Bennington got underway from New York and transited the Panama Canal on the 21st. The carrier arrived at Pearl Harbor 8 January 1945 and then proceeded to Ulithi Atoll, Caroline Islands, where she joined TG 58.1, 8 February. Operating out of Ulithi she took part in the strikes against the Japanese home islands (16-17 and 25 February), Volcano Islands (18 February-4 March), Okinawa (1 March), and the raids in support of the Okinawa campaign (18 March-11 June). On 7 April Bennington's planes participated in the attacks on the Japanese task force moving through the East China Sea toward Okinawa which resulted in the sinking of the Japanese battleship Yamato, light cruiser Yahagi, and four destroyers. On 5 June the carrier was damaged by a typhoon off Okinawa and retired to Leyte for repairs, arriving 12 June. Her repairs completed, Bennington left Leyte 1 July and during 10 July-15 August took part in the final raids on the Japanese home islands. She continued operations in the western Pacific, supporting the occupation of Japan until 21 October 1945. On 2 September her planes participated in the mass flight over USS Missouri (BB-63) and Tokyo during the surrender ceremonies. Bennington arrived at San Francisco 7 November 1945 and early in March 1946 transited the Panama Canal en route to Norfolk. Following pre-inactivation overhaul, she went out of commission in reserve at Norfolk 8 November 1946. The carrier began modernization at New York Naval Shipyard 30 October 1950 and was recommissioned 13 November 1952. Her shakedown lasted until May 1953, when she returned to Norfolk for final fleet preparations. Between 14 May 1953 and 27 May 1954 she operated along the eastern seaboard; made a midshipman cruise to Halifax, Nova Scotia; and a cruise in the Mediterranean. At 0811, 28 May 1954, while cruising off Narragansett Bay, the fluid in one of her catapults exploded, setting off a series of secondary explosions which killed 103 crewmen and injured 201 others. Bennington proceeded under her own power to Quonset Point, R. I., to land her injured. Moving to New York Naval Shipyard for repairs she was completely rebuilt during 12 June 1954-19 March 1955. On 22 April 1955 the Secretary of the Navy came aboard and presented medals and letters of commendation to 178 of her crew in recognition of their heroism on 26 May 1954. Bennington served as a platform for innovations in Naval Aviation. On 22 August 1955, operational testing of the mirror landing system installed on the ship was begun by VX-3. Commanding officer Cmdr. Robert G. Dose, flying an FJ-3 Fury made the first landing with the device. 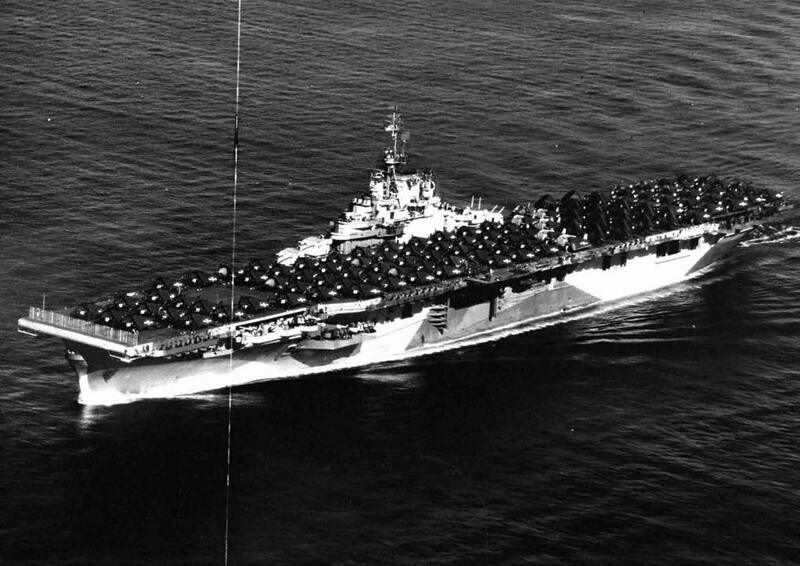 Bennington stayed with the Atlantic Fleet until departing Mayport, Fla., 8 September 1955 for the Pacific. She steamed by way of Cape Horn and arrived at San Diego one month later. On 18 May 1966, the XC-142A tri-service V/STOL transport made its first carrier takeoffs and landings during test conducted aboard Bennington at sea off San Diego. The tests, including 44 short and six vertical takeoffs were made with wind over the deck varying from zero to 32 knots. Lt. Roger L. Rich Jr., and other pilots from the Navy, Marine Corps, and Army took turns at the controls. Bennington also was involved in the U. S. space program, recovering the unmanned Apollo IV spacecraft about 600 miles northwest of Hawaii, after its 81⁄2-hour orbital flight on 9 November 1967. Bennington was decommissioned 15 January 1970. She was stricken from the Navy List in 1989 and sold 1 December 1994 by the Defense Re-utilization and Marketing Service (DRMS) for scrapping.